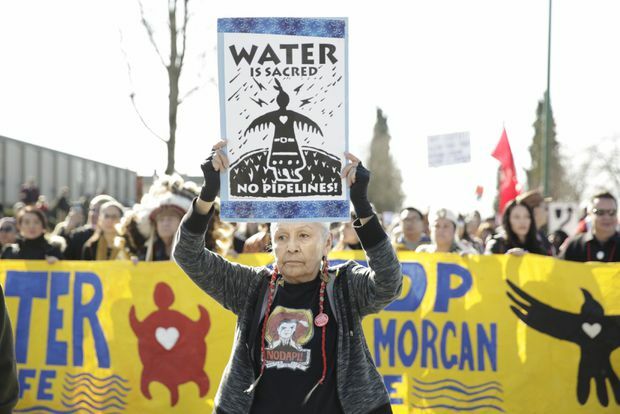 Harriet Prince, 76, of the Anishinaabe tribe marches with Coast Salish Water Protectors and others against the expansion of the Trans Mountain pipeline. British Columbia’s Court of Appeal will consider a key question regarding provincial powers in the political battle over the future of the Trans Mountain pipeline expansion project during a five-day hearing that starts Monday. The B.C. government’s reference case asks the court if the province has jurisdiction to regulate the transport of oil through its territory and restrict bitumen shipments from Alberta. Specifically, it asks if proposed amendments to British Columbia’s Environmental Management Act are valid and if they give the province the authority to control the shipment of heavy oils based on the impact spills could have on the environment, human health or communities. The province is also asking the court whether the amendments are overridden by federal law. Alberta Premier Rachel Notley and Prime Minister Justin Trudeau have said only Ottawa, not the provinces, has the authority to decide what goes in trans-boundary pipelines. Alberta and Saskatchewan have both filed documents as interested parties supporting the federal government in the case. When B.C. filed the reference case last year, Alberta announced it would ban B.C. wines and accused Premier John Horgan of trying to break the rules of Confederation in newspaper ads. Last summer, the Federal Appeal Court overturned approval of the project to triple oil shipments from Edmonton to Burnaby, B.C., ruling that the National Energy Board had not properly considered its impact on marine life nor had Ottawa meaningfully consulted with Indigenous groups. Last month, the board found that the pipeline is still in the public interest despite the risk that an increase in tanker traffic could adversely affect southern resident killer whales, hurt related Indigenous culture and increase greenhouse gas emissions. It added 16 new recommendations for federal government action in addition to the 156 conditions in its initial approval in 2016. The federal government purchased the pipeline last year. Trudeau has said the expansion is in the best interests of all Canadians and his government has committed $1.5 billion to an ocean protection plan that includes millions for research on B.C. killer whales. Horgan said last year the aim of the case is to protect the province’s coastline and economy from the harms of an oil spill. “We believe it is our right to take appropriate measures to protect our environment, economy and our coast from the drastic consequence of a diluted bitumen spill,” Horgan said in a statement when the reference case was announced last April.